Scott Redding open edition giclée fine art print by Billy. This oil on canvas painting by Billy shows Scott Redding riding the Marc VDS Moto2 race bike resplendent with the Union Jack to his historic win at his home GP at Silverstone in the 2013 Moto2 championship MotoGP support class. The print is available in A4, A3 and A2 and is embossed and signed by Billy. The scene shows the very first corner as seen from Copse as Scott got the holeshot from Takaaki Nakagami, Tom Lüthi, Johan Zarco and the rest of the Moto2 pack. The original oil painting of Scott Redding is A3 in size. Each print purchased will receive a free A4 pencil fine art print of his Podium celebrations. This cartoon art by Billy of Scott Redding riding the Marc VDS Moto2 race bike in the 2013 Moto2 championship MotoGP support class is available in four sizes A5, A4, A3 and A2. 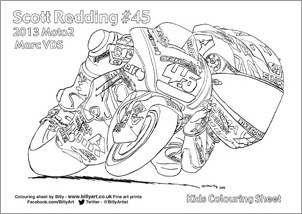 Scott Redding A4 Kids Colouring Sheet To left. To download the Scott Redding Colouring sheet by Billy alt click (or cntl click) for Mac users. Right click and save target as for PC users. *These fine art prints of Scott Redding have free UK Post and Packing. International orders have an additional cost as I use Royal Mail 'Airsure' or 'International Signed For' to ship them. Simply use the drop down button by the BUY NOW to select the size print you require from either the UK or International prices.